On Saturday, after Connor's last soccer game of the season, we drove to Orlando for our fun family weekend. We ate at Uno's for lunch, then we checked in to our hotel and went to the Rainforest Cafe at Downtown Disney for dinner. 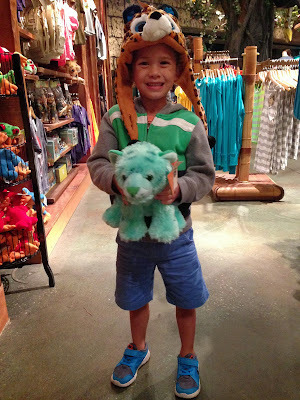 We told the kids they could each pick out a toy on the weekend trip and they decided they had to have their toy immediately, so they each picked out a stuffed animal at the gift shop in the Rainforest cafe. Connor picked out a light blue/green tiger and Paige picked out a pink giraffe. We got some cotton candy after dinner and walked around and did some people-watching and enjoyed the Christmas decorations. 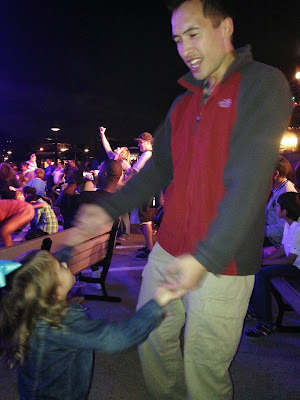 There was a dance party/competition at the outside stage area in Downtown Disney and we stopped in and watched the show. We all danced a little bit, but it was late and we didn't stay out too late. 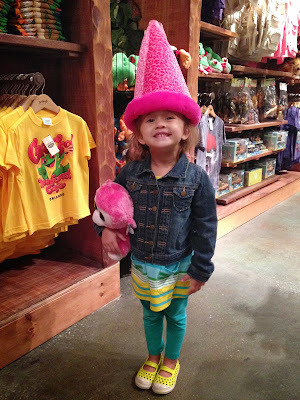 On Sunday morning, we woke up and went to the Animal Kingdom. The weather was a little warm, but it was still much nicer than most summer days would be. On this trip we decided we'd try and see a lot of the things we don't normally do at the park. We rode a train over to the Rafiki's Planet Watch area and did some exploring. We normally just gravitate towards the rides, but this trip we looked at all the animals and Connor participated in their Wilderness Explorer game. He got a little log book and at various stations throughout the park he would earn "badges" (stickers) by completing tasks. At the Conservation Station we took our picture with Rafiki and got to see some animals up close. The animal petting area was probably the nicest and cleanest "petting zoo" that we've seen, but we didn't stay too long since it was a bit gross with all the kids and animals running around. We got a snack, watched the Animal Kingdom Christmas parade, the Nemo show, rode some rides, then we eventually left and went to Uno's for dinner! Connor took a nice picture of us at dinner. Overall, it was a good day. Connor's favorite part was the Lion King show and Paige's favorite part was the guy that spun a flaming torch during the Lion King show. The day was fun, but it was very stressful at times. For our trips, the entire day's enjoyability is based on Paige's mood and behavior. Unfortunately, at the Animal Kingdom, Paige was not in a good mood. 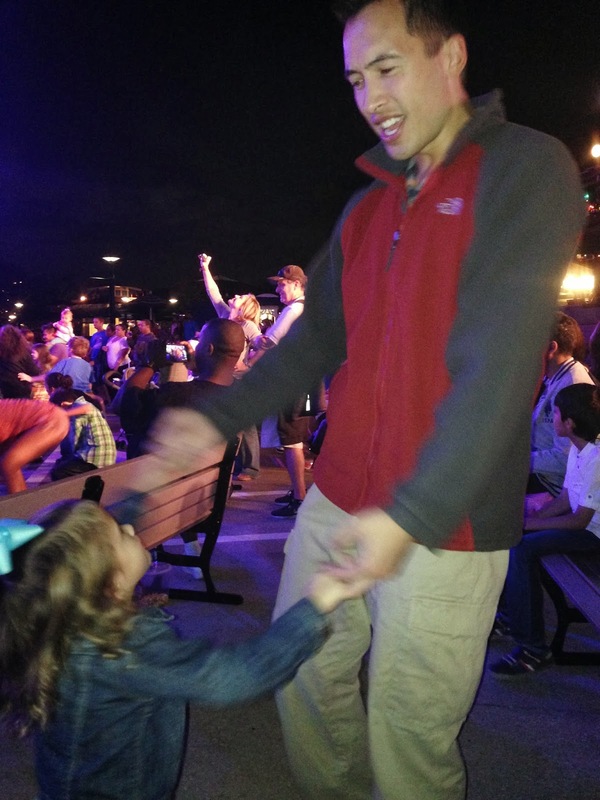 She got in trouble and timeout probably ten times from the time we got to Orlando until we were done at Animal Kingdom. There were so many incidents I can't even remember them all, but she got in trouble for not using her manners, kicking Connor in the stroller, and for not listening. On the train ride, she decided she wanted to sit in the back seat and when Andrea asked her to move, she threw a fit and stuck her head and arms out the side of the train. Andrea made Paige sit by her and Paige screamed for the entire ride. I don't think the people around us were thrilled to be sitting by us. Once Paige starts throwing a fit, it's not something you can snap her out of. It's a force of nature and just has to run its course. Typically it's inconvenient to deal with at home. In public, at an amusement park, it's pretty stressful to wait the 10-15 minutes that it sometimes will take. Eventually, she will come around and get over it, but it's not much fun to deal with. We've found that it's important to stay patient and calm and get through it. I took a 2 minute video of her during one of her fits. Thankfully, Connor was on his best behavior throughout the trip. He is so patient and sweet. He definitely helps us all out.